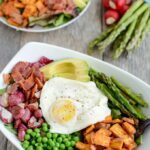 Loaded with spring vegetables and topped with over-easy eggs, this paleo, gluten-free Spring Breakfast Salad is an easy and delicious way to start your day with more veggies! Thanks to Davidson”s Safest Choice Eggs for sponsoring this post. A couple months ago I shared these Baked Scotch Eggs! They’re great for breakfast, dinner or snacks. This month, we’re switching gears a little bit and talking about how to get more veggies at breakfast! Before you go running for the hills at the thought of eating a salad for breakfast, give me a chance to make my case for this one! First of all, I used fresh spring veggies which are currently in-season right now and tasting their best. Second of all, if you like runny eggs, this is definitely a recipe you need to try. We’re basically using these egg yolks as a nice little salad dressing. If you have the option to buy pasteurized eggs, I’d definitely recommend it! Place sweet potatoes and radishes on a foil lined baking sheet and roast at 400 degrees for 10 minutes. Stir, add asparagus and roast for 10 minutes more. Fry two eggs, leaving yolk runny. Divide lettuce between two bowls. 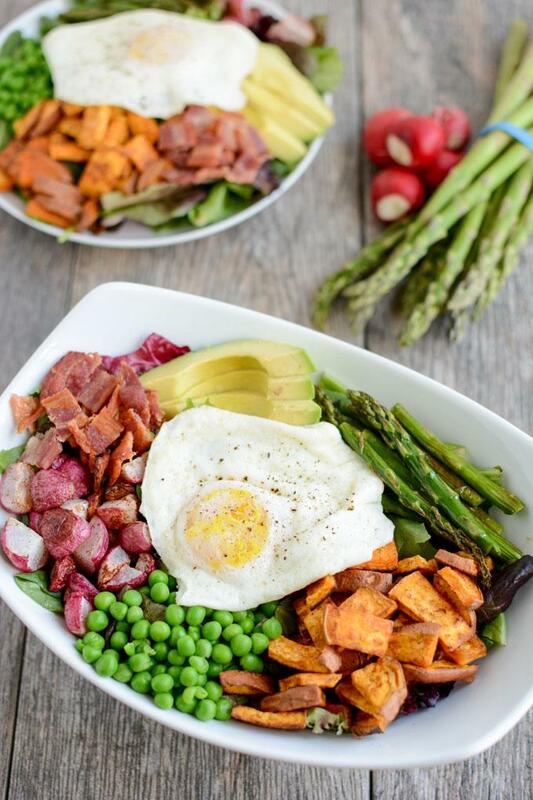 Top each with sweet potatoes and radishes, steamed peas, bacon, avocado and a fried egg! Feel free to change things up and add your favorite veggies! 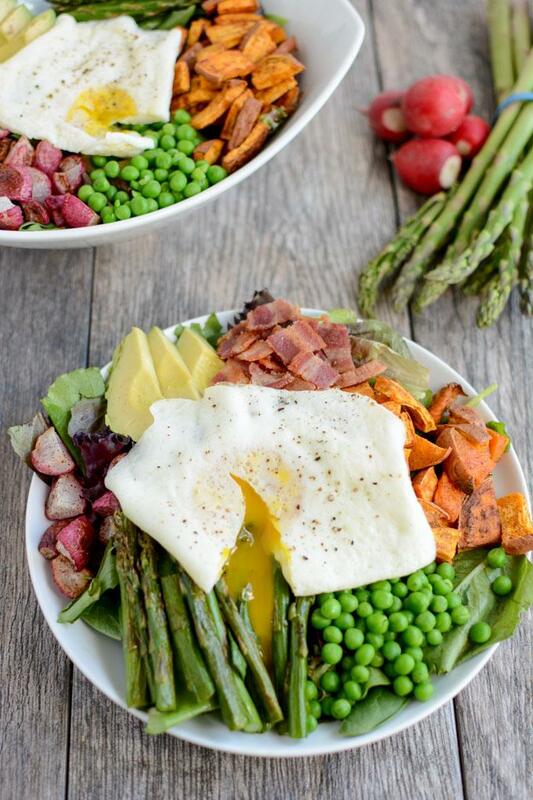 This Spring Breakfast Salad from @leangrnbeanblog is packed with seasonal veggies! This looks so good! I’d make this for breakfast, lunch and dinner. I so so love the idea of a salad for breakfast – especially when it’s topped with a decadent egg! Pinned, yummed and drooled all over this one – thanks for the inspiration, Lindsay! Yum! I love this kind of a meal for any time of the day! I don’t believe I have ever had a salad for breakfast, that is going to have to change this Sunday! It looks so fresh and healthy.